High Commission of India , Port Moresby, Papua New Guinea: Events / Photo Gallery - Mr. Manish, Joint Secretary, Ministry of External Affairs, Government of India, meets Hon. Richard Maru, Minister for National Planning and Monitoring, Government of Papua New Guinea, in New Delhi on 28 March 2019. PNG High Commissioner to India, Mr. Paulias Korni, joins them. They discussed entire gamut of India-PNG ties. Mr. Manish, Joint Secretary, Ministry of External Affairs, Government of India, meets Hon. 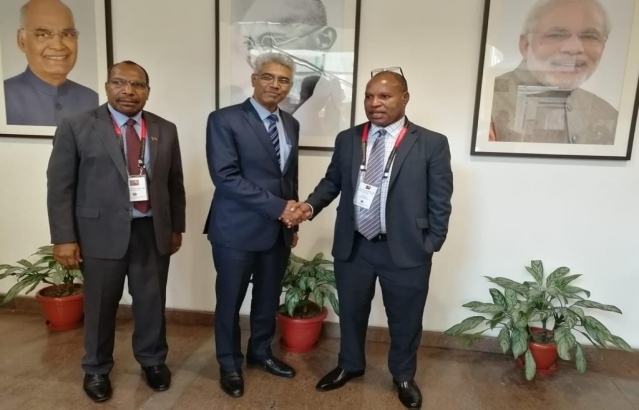 Richard Maru, Minister for National Planning and Monitoring, Government of Papua New Guinea, in New Delhi on 28 March 2019. PNG High Commissioner to India, Mr. Paulias Korni, joins them. They discussed entire gamut of India-PNG ties.